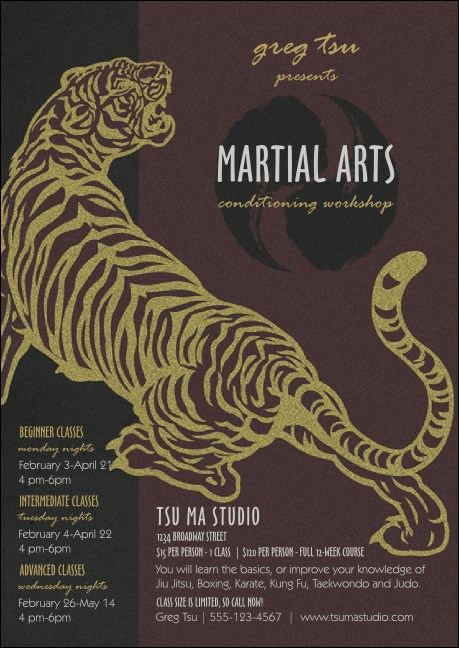 Fight for the spotlight when you mail this Martial Arts Club Flyer! All that glitters is this formidable gold tiger on a black and deep purple backdrop as he turns toward the vitality of a Yin Yang design. Lest you think the space won't allow for the dissemination of much info, there are 23 spaces for your every event detail. Send the perfect club flyer with TicketPrinting.com.